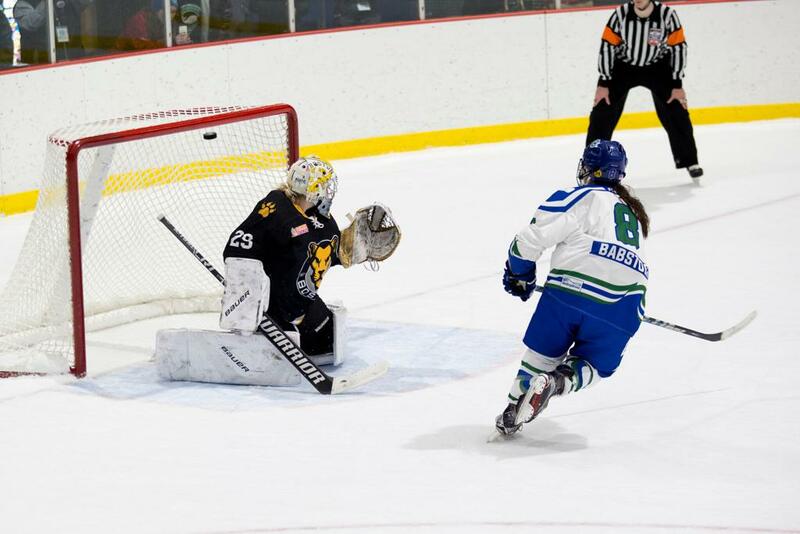 Connecticut Whale forward Kelly Babstock has been named NWHL Player of the Week after scoring a goal and adding 2 assists, and then scoring the lone shootout goal in the Whale’s 4-3 victory over the Boston Pride on Sunday. The former Quinnipiac star scored with 2:26 remaining in the third period to start the Whale comeback rally and pull the team within a 3-2 deficit. She also notched an assist on Sam Faber’s game-tying goal with 59 seconds left in regulation. Babstock scored on a blazing wrister past Brittany Ott in the shootout to complete the victory. One of the top players in the young history of the NWHL, Babstock is in her third season in the league and with the Whale. The forward from Mississauga, Ont. had 19 goals and 22 assists for 41 points in 35 games over the league’s first two seasons. She was tied (with Kelli Stack) for the team lead in points in 2015-16 by going 9-13-22 in 17 games. Last season, she was third in scoring on the Whale with 10-9-19 in 17 games. Babstock is the all-time leader at Quinnipiac in goals (95), assists (108) and points. As a freshman, Babstock was named ECAC Player of the Year. In her senior year, she was a finalist for the Patty Kazmaier Memorial Award as the best college player in the country and received an All-American award. She also played lacrosse at Quinnipiac. She is the Hockey Director at Fairfield Ice Academy, and coaches two lacrosse teams: a freshman team at Staples School in Westport, and a squad from Fairfield Youth Lacrosse. Prior to this season, Babstock proudly discussed her heritage and a project she would like to complete someday. In their next game, Babstock and the Whale travel to Newark on Dec. 3 to take on the Riveters at Barnabas Health Hockey House at 3:00.